How to Print Text Messages from Samsung Galaxy Series? Home > Resources > Manage Samsung > How to Print Text Messages from Samsung Galaxy Series? How to Delete Apps from Samsung Galaxy S6/S5/S4/S3? Samsung Galaxy S9 vs iPhone X: Which is Better? Samsung Data Transfer - How to Transfer Data from Samsung to Another Smart Device? Samsung File Manager - How to Manage Samsung Files Effectively? 1. You saved a lot of precious text messages on your Samsung smartphone and not willing to delete them. But the capacity of your phone is limited, so you must delete some vital messages to ensure your phone can normally receive and send new messages. 2. You're always communicate with your boy or girlfriends by text messages, so it is undeniable that you have received and saved lots of sweet messages on your Samsung phones. Then you want to print out these messages from your Samsung Galaxy S3 as a kind of memories. No matter what circumstances you are, you can follow the method in this article to achieve your goal by printing out text messages from Samsung Galaxy S9+/S9/S8+/S8/S7/S6/S5/S4/Notes or other Android-based smart phones. Well, let's check the methods below. Here, you can choose a reliable SMS Exporter software as your assistant. If there is no clear ideal in your mind, you can take this Samsung Messages Backup into your consideration. With it, you can export SMS messages from Samsung to PC and save them in .csv, .html or .txt format. Then you can open these files and print them out directly. Below is the detailed instructions on how to use the Samsung SMS backup to export text messages from Samsung phone to computer, just follow the steps on your own computer. Click on the "SMS" button in the left panel, then the program will show all text messages on your Samsung phones one by one. You're enabled to preview these conversations on the program until find the one you want to export. Select them out and then click "Export" to finish the exporting process. Tips: You can select a batch of messages and export them at one time. Note: Optionally, you can click the Browse button and select a folder on your computer to export the messages to. 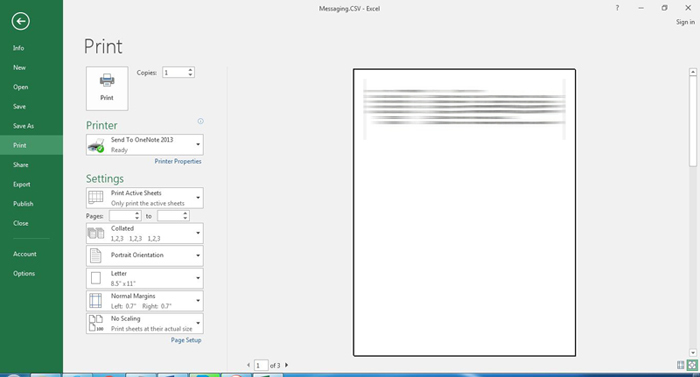 Find the exported message files and open it, then you can print them out through the local Printer easily. If your computer is not connected with a Printer, you can copy these files to a PC which is connected and print them out. 1. Double-click to open the SMS.csv file in Microsoft Excel. Note: If you have no MS Excel installed on your computer, you need to install it or you should use other tools to view the CSV file. 2. From the Excel interface, you can adjust the cells of the spreadsheet to accommodate and fit the contents according to your needs. 3. Click File from the top and then turn to the left pane of the opened window and click the button Print. 4. Navigate to the top-left corner of the right pane, set the number of copies you want to have printed. 5. Click Print when done. The recommended Samsung SMS Backup program above works best in transferring text messages between a Samsung device and computer. Apart from text messages, it can also transfer contacts, photos, videos, music, apps and more from any Android device to computer, and vice versa. Just feel free to try it out.